A formula field (Stack by) then links their selection to the Y axis. It is working well with one slight snag - the ordering of the options in the selected field is coming out alphabetically and not as in the original field. It does not appear possible to change this. Does anyone have workaround to this problem? 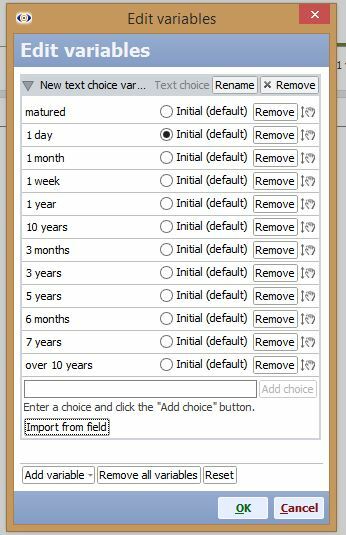 When creating a variable, there is an option to 'import from field' - that means that you do not have to manually enter the values, Omniscope will automatically enter all the different category values, see image. In this window you have a chance to re-order the values by dragging the little hand icon. and organise the values for each of the fields prior to using them as variables. You are right. I am using the variable to switch between different fields, so the first option does not work. I already had the fields in the correct order when I created the variable/formula field. I can reorder the field options when it is chosen in the variable "Analyse by:"
The problem is that as soon as I choose another field and return to the original field the order is in alphabetical order again. I have a had a look at your file. You are not using the formula field to split/stack or on the y axis of the pivot table. My problem is that I am using the formula field to do all these things so that the pivot table/ graph changes simultaneously to what has been selected. It is here that I am getting different orders from the original field. That's a shame it would have been a very powerful and elegant solution to have all views changing simultaneously. For our clients the ordering and colouring is essential.